A new fad that is sweeping like wildfire is to have cupcakes instead of cakes. It makes sense- no cake cutting issues, the ability to offer more flavors, less plates used, etc. I decided to go with cupcakes because I have family members with food allergies and because they are easier to make and transport, my mother can make them for me, saving me a ton of money. I had a lot of fun coming up with the flavors (gluten-free lemon chiffon, red velvet with cherries and chocolate- all frosted with gluten-free buttercream frosting), the look (gluten-free lemon sugar candy, maraschino cherries and chocolate frosting ”L”s), and the super-cute candy striped cupcake liners (on the right). I am also in the process of trying to figure out a way to make a stand that holds vintage metal TV trays to put the cupcakes on. If I figure out a way to do it, I will post it for sure! Another great giveaway for my rockabilly seamstress readers. Ends May 10th. Wow. When I came across these Save the Date handkerchiefs on Alisha Clark's blog (through the Pink Book Blog that I post on) I was floored. I was also extremely jealous- why didn't I think of that?!? The pictures speak for themselves at how cool an idea this is. 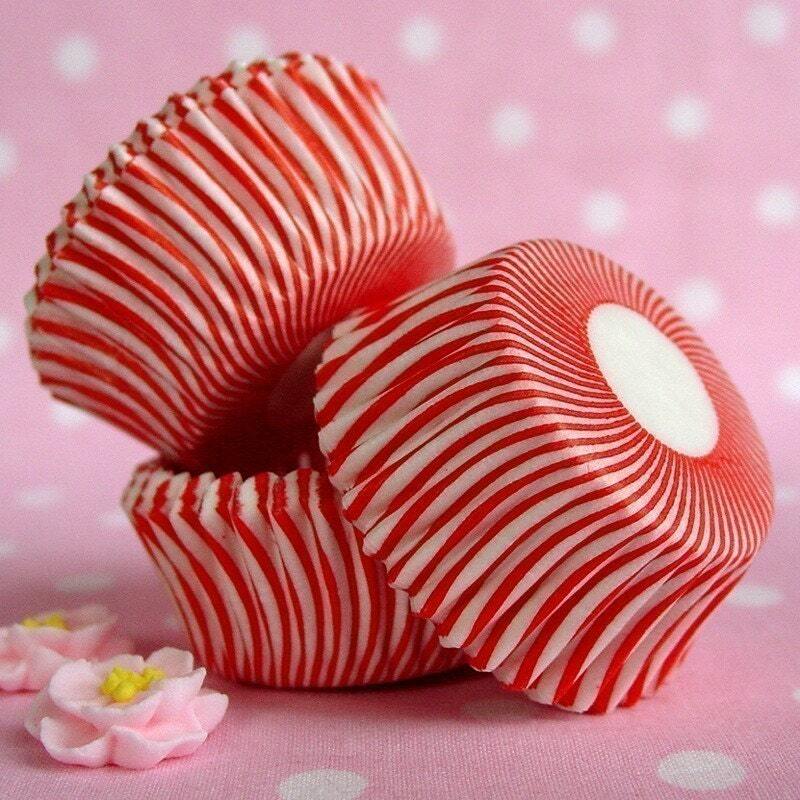 How do you get your hands on some of these for yourself? The talented Erin at Lucky Luxe did them and she also does business card hankies. I have been obsessed lately with vintage handkerchiefs and have been slowly amassing a large collection of them. The personal history behind them makes me feel like I am connecting to some amazing women who often handmade and/or trimmed them. I always have one stuffed inside my sweater cuff in the winter and neatly tucked under my belt when I wear vintage dresses. In fact, I have so many vintage hankies now that I will be adding them to my Tart Deco shop very soon. Nothing says Vintage Glamour & Retro Style than a pink linen hankie with hand-crocheted edges. 1. Tell me a creative way to use a handkerchief. This could be a cool way to fold it, paired with something, sewn onto something, etc. 2. Visit my etsy shop, Tart Deco, and tell me what your favorite item is or other vintage or retro items/sections you would like to see me add. --Make sure that your email is available through your blog profile or put it in the comment so I have a way to contact you. For an extra entry become a follower of this blog (or let me know you already are) and leave an extra comment for your extra chance to win. The giveaway ends May 1st at 10 pm central time and I will post the winner (chosen by using random.org) on May 2nd. NOTE: I do NOT do the printing on the hankies, I just have the hankies themselves. If you want the printing done contact Erin at Lucky Luxe. I am IN LOVE with these adorable handmade wristlets from The Lucky Pebble. What a fun modern accessory to add to a vintage look. For $15-20 these fun and practical purses are one quick grab away from a night on the town with no hassles. They also offer mini wristlets. Hey brides, wouldn't these be great bridesmaids gifts? I'm thinking yes... The one pictured above just happens to be called "Wedding Shower Luncheon." I guess great minds think alike! I will most definitely be asking for one of these as a wedding gift to take with me on my honeymoon. 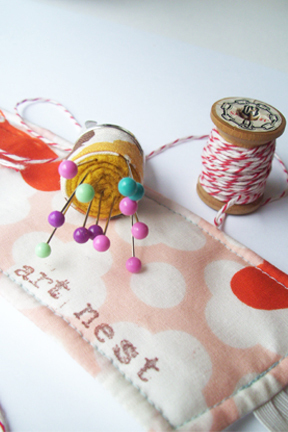 If you visit the Lucky Pebble Blog, there is a giveaway for one of the newer designs. Ends May 6. Labels: Giveaways, Vintage Wedding, What's on Sale? I have been getting a lot of questions from my wedding guests about what to wear to a rockabilly/50s wedding. 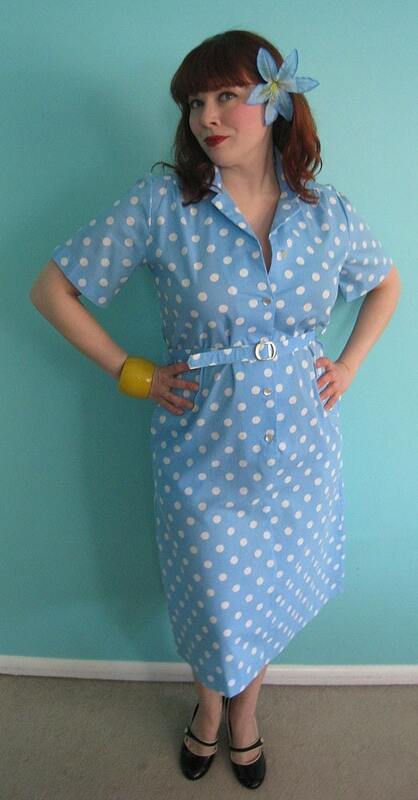 I have set up a flickr photo set of possible options, but when it comes right down to it, nothing beats a versatile shirt dress. 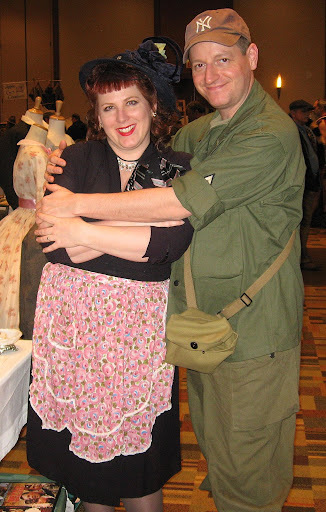 The style works for so many body types, its comfortable and because so many eras did their "take" on it, it's pretty easy to find them in every size, vintage or modern. I especially like them for mother of the bride dresses. 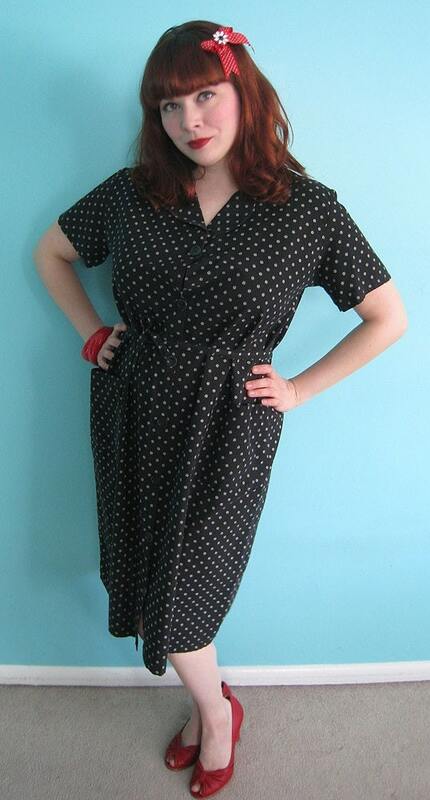 Retrorocketgirl has 2 adorable polkadot dresses right now for only $25 each! 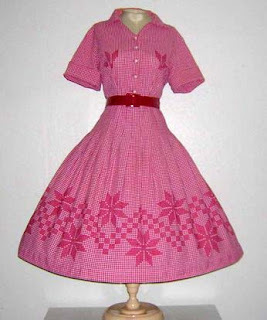 This super-rockabilly gingham dress is to drool for, yes? 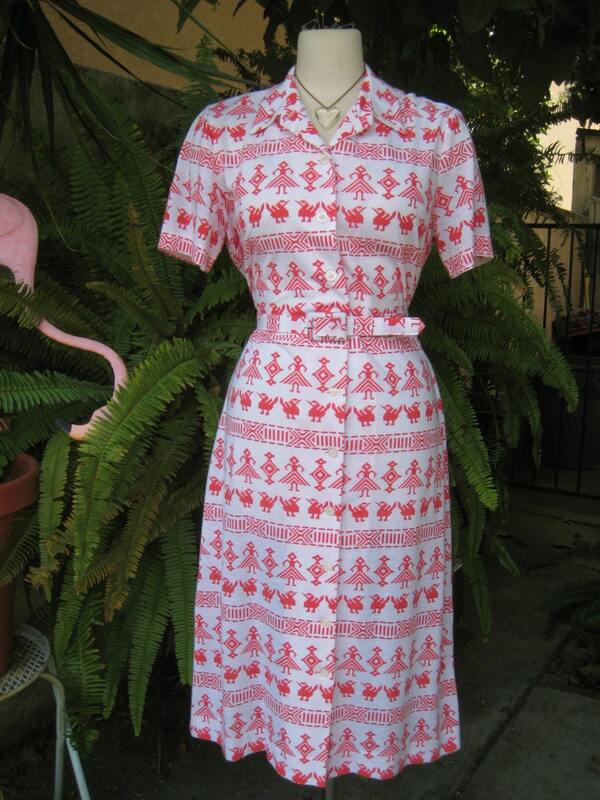 $55 at VintageJubilee, this dress is a large. 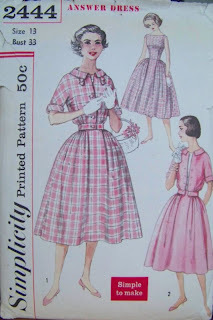 Remember, you can resize vintage patterns if you can't find them in your size! 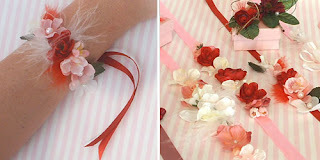 I saw this post on Vintage Glam Weddings (now Ruffled.com) for DIY wristlets and boutonnieres and thought they were easy, yet cute. This could easily be used for a 50s style wedding or modified with some different materials for a rockabilly or goth wedding. I also like the idea to use them as place cards. 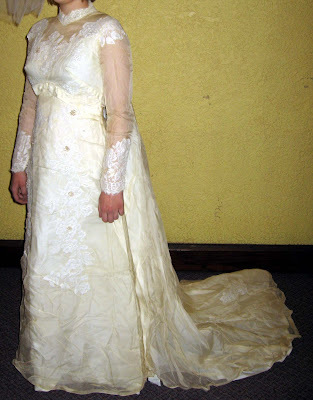 Like many of you, I was given my mother's wedding dress to use as I saw fit for my wedding. I knew I wouldn't be able to use it as is because I wouldn't be able to fit into it to save my life (this is my 14 yr-old, size 6, niece modeling it) and it wasn't the style that would fit with my rockabilly theme. 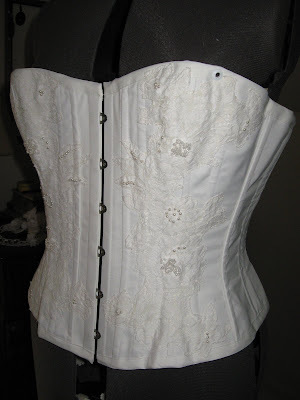 I decided to have it made into my wedding corset. I mentioned in a previous post that I found a delightful seamstress to make my corset for me, so the next step was to prepare the material and see if it could be repurposed. The dress was a satin acetate with a netting overlay that also had pieces of beaded lace stitched onto it. There was a matching train that attached at the shoulders. I planned on using the acetate as the outer layer of the corset with pieces of the beaded lace as an accent. Despite not being stored properly, the acetate was in pretty good condition and hadn't yellowed at all. The overlay and lace had yellowed, but were still in good shape (no holes, beading complete). There was a slight odor that I knew would come out with washing it. Yes, I said washing it. My mother had looked into having the dress drycleaned and it would have costed anywhere from $150-300! This would have been acceptable if I was planning on wearing the dress as is, but for material pieces- no. I did some research on cleaning methods of vintage clothing and decided to chance washing the material myself, keeping in mind that water does break down the fibers of acetate. I thought it best not to wash the dress sewn together, especially because I was only going to use the train for the acetate and 2 pieces of the beaded lace, so I took the dress apart and only washed the pieces I needed. This way, if the washing did ruin the material, I still had more to try using another method. I ended up soaking the material in oxyclean overnight and airdrying the pieces on plastic hangers. As you can see by the pictures of my corset, the material cleaned up nicely! Emily of Rohm on etsy did a marvelous job of constructing the corset from my ideas and added the lace on the front panels. Isn't that sweetheart shape to the top of the corset to die for? The curves are gorgeous and it gives a marvelous base for my aunt and me to shape my wedding dress bodice on. It hardly feels like I have it on at all! Blog Feature on Me- Yay!